Lionel Messi just cannot stop breaking records, can he? The forward grabbed a hat-trick in Barcelona’s 4-0 win at APOEL Nicosia to become the all-time record goals scorer in the Uefa Champions League with 74 goals on Tuesday. This record could change hands in subsequent games this season- bearing that Real Madrid forward Cristiano Ronaldo is four goals shy of the new benchmark- but Messi has achieved the landmark in 91 games, 51 matches better than Raul, who scored 71 goals for both Los Merengues and Schalke. Messi, 27, was not the only record breaker on Tuesday evening, as legendary Italian midfielder Francesco Totti, at the age of 38 years and 59 days, beat his own record as the Champions League’s oldest goalscorer after opening scores for AS Roma in their 1-1 draw at CSKA Moscow. 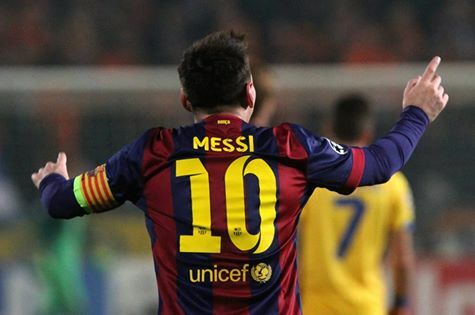 Lionel Messi Scored His Career 74th Champions League Goal Against APOEL on Tuesday to Become the All-Time Record Goal-Scorer in the Uefa Champions League. Image: AFP/Getty. Sergio Aguero’s hat-trick kept Manchester City’s Champions League ambitions alive against ten-man Bayern Munich after defender Mehdi Benatia was sent off for bringing down the Argentine striker in the goal area. And most importantly, Chelsea trounced Schalke away in Gelsenkirchen to win Group G and advance into the round of 16, as Ukrainian champions Schakhtar Donetsk joined Group H winners FC Porto in the knockout stages. As it stands Real Madrid, Borussia Dortmund, Bayern Munich, Paris St-Germain, Barcelona, Chelsea, Porto and Shakhtar are all through to the last 16. Vasili Berezutski’s last-minute equaliser earned CSKA Moscow a lifeline at home to AS Roma in one of Match Day 5’s early kick-off. Totti fired Roma ahead with a sublime free-kick in the 43rd minute behind closed Arena Khimkhi doors, but Berezutski’s injury-time leveler secured a glimmer of hopes for the Russian champions ahead of their trip to Munich in a fortnight. Francesco Totti Celebrates After Scoring the Opener at the Arena Khimki. Image: Getty. With Roma and CSKA sharing the spoils, City were assured of remaining in the championship until the final day of the group stages but, notwithstanding did their own portion of the job by sealing a narrow win over ten-man Bayern at the Etihad Stadium. Moroccan defender Benatia received his marching order for impeding Aguero in the goal area. The striker stepped up to bury the ball inside the net with precession. Despite the numerical disadvantage, Pep Guardiola’s men restored parity after a sustained period of coordinated passes and counter-attack. Birthday boy Xabi Alonso drove a low free-kick past a deceived Joe Hart into the net five minutes to the break. The Bavarians proceeded into the interval with a 2-1 advantage courtesy of a Robert Lewandowski powerful header. The Pole outmuscled the City defence, rose high to meet a right-wing cross and looped the ball over Hart; in off the post. An Alonso error paved way for Aguero’s second on 85minutes, as Stevan Jovetic intercepted the Spaniard’s pass to release City’s highest goal scorer one on one on goal and he calmly stroke in off the far post. Aguero completed his hat-trick five minutes later as Jerome Boateng’s poor touch on the ball allowed him beat Manuel Neuer with an enviable composure. Sergio Aguero Celebrates His Hat-Trick With Stevan Jovetic at the Etihad Stadium. Image: Getty. Group winners Bayern remain on 12 points, while the rest of Roma, CSKA, and City are tied on 5 points in that descending order. The Premier League champions must now win their final group match at Roma and hope Bayern beat CSKA in Munich to seal their Champions League great comeback in the next two weeks. City could also qualify, assuming CSKA lose at Bayern and they secure a score draw at the Stadio Olimpico. Messi’s hat-trick and Luis Suarez’s maiden striker for Barcelona helped already qualified Barcelona maintain their push for group dominance at APOEL. Suarez opened his Baulgranas account on 27 minutes, squeezing the ball into a corner after a maneuvering the Cyprus club’s defence. Messi doubled the Catalans’ lead from close range in the 37th minute to break Raul Gonzalez’s record of 71 Champions League goals with his’ 72nd strike in just 91st appearances. He then latched on to a Dani Alves through pass and masterfully dinked the ball beyond goalkeeper Urko Pardo in the 58th minute. He finished with a flourish three minutes to the dead, when he simply tapped in Pedro’s cut-back for his 74th goal in Europe’s elite club competition. The win increased second-placed Barca’s point haul to 12 after 5 rounds of matches, while APOEL are rock-bottom of the standings with a solitary point. Edinson Cavani’s brace and Zlatan Ibrahimovic’s lovely effort ensured PSG retain their claim to group superiority, despite Klaassen’s 67th-minute leveler. Group leaders PSG are just a point better than Barca. It will be a straight fight between third-placed Ajax and APOEL for the Europa league spot on Match Day 6, with both sides already out of the Champions League. Mourinho’s Chelsea “avoided crucial match” scramble by thumping Roberto Di Matteo’s Schalke 5-0 in front of their home fans. The win guaranteed the Blues’ progress to the knockout stage and also handed them an unassailable 11 points, four ahead of third-placed Schalke. Didier Drogba Celebrates His 50 Goal in Europe Against Schalke. Image: AFP/Getty. Captain John Terry headed home Cesc Fabregas corner after two minutes, Willian fired under goalkeeper Ralf Fahrmann’s to double Chelsea’s lead on 29 minutes. Jan Kirchoff beat two of his team-mates to head Fabregas’ corner past his own goalkeeper a minute to the break. Substitute Didier Drogba grabbed his 44 Champions League goal in the 76th minute, finishing off a Willian cut-back. The Ivorian turned provider two minutes later, sending a deep cross to Ramires, who climbed to head into the net from close range. Goals from Carlos Mane, Luis Nani and Islam Slimani ended Maribor’s Champions League ambition, as Jefferson Nascimento’s own goal proved too insignificant on the evening. Louis Nani Has Now Scored Four Champions League Goals for Sporting This Season. Image: Getty. The home side led 2-1- through Mane and Nani strikes blighted by Jefferson’s own goal- at the interval, during which the light’s went out causing a lengthy delay. On resumption of play, Slimani added Porto’s third to seal victory. The result leaves Sporting second in the pool, two points ahead of Schalke with a trip to Chelsea’s Stamford Bridge left. Hector Herrera, Jackson Martinez and Christian Tello guided already qualified Porto past Belarusian champions Bate at the Borisov Arena. Bate have now conceded 22 times- equaling the record for the most goals against in a Champions League group stage. The win helped Porto clinch the group on 13 points with just a game to spare, while Borisov are bottom on three points. Mikel San Jose’s solitary strike kept Athletic Bilbao’s European aspirations alive but ended Shakhtar’s hopes of topping the group. San Hose struck on 68th minute to deflate the roaring crowd at the Arena Lviv. The win for the Spaniard’s and Porto’s crushing victory at the Borisov Arena ensured the Portuguese will top the group with the Ukrainians second regardless of the outcome of the two side’s meeting at the Estadio do Dragao in the final round of matches.